SolidRun has this week unveiled a new addition to its ClearFog range of boards with the launch of a new single board computer (SBC) in the form of the ClearFog Base, that is ideal for network-based projects and more. The small mini PC is equipped with an Marvell ARMADA 38x processor supported by up to 2GB of RAM, and can be equipped with 4GB of eMMC storage. SolidRun has also included a handy microSD card reader to expand the internal memory further if required. 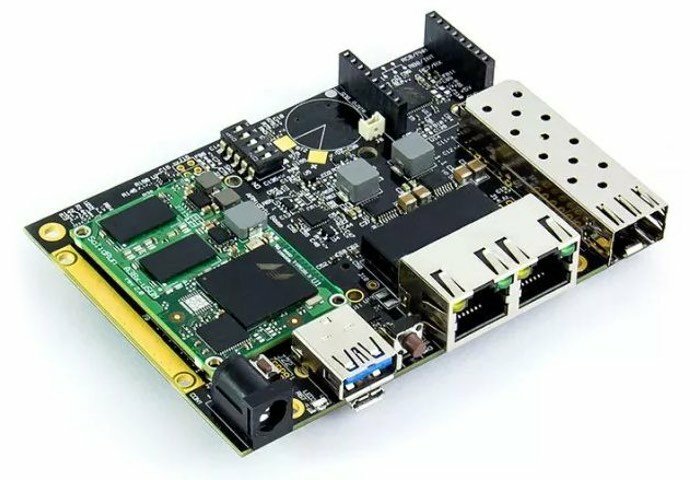 Other features of the SBC mini PC include dual Gigabit Ethernet ports, mPCIE slot, USB 3.0 port and a GPIO-based mikroBUS socket, as well as support for Click Boards from MikroElektronica. Click boards are plug-and-play modules designed to add extra functionality to existing development kits. These small, function-specific add-on boards/modules all have a common interface to the mikroBUS adapter board. There are over 150 Click Boards available allow developers to easily implement features such as Bluetooth, temperature sensing, humidity sensing and analog-to-digital conversion. The ClearFog Base has been designed to support open source software including OpenWRT, Yocto, or other that support the Linux 3.x kernel. For more information on the new ClearFog Base jump over to the SolidRun website for full specifications by following the link below.